A unique collection of wine presses is located at the Valtice branch of the National Museum of Agriculture. You can see them as late as November weekends and on Friday 17 November, when the museum will always be open from 10 a.m. to 2 p.m. Do not forget that you can use an admission ticket to the Valtice Château for entry to the museum. 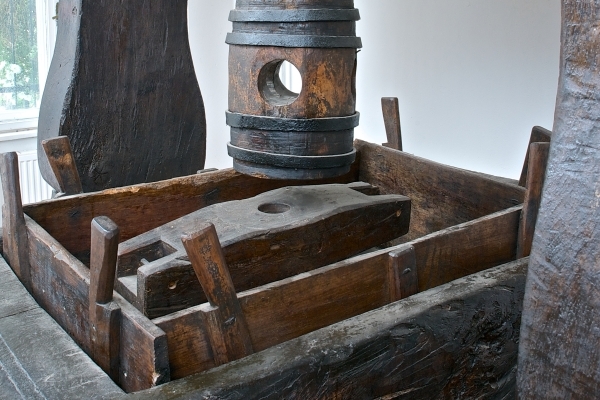 The oldest and most valuable is a monumental spindle press from 1719. Its total height is 280 cm (9 ft 2 in), width 272 cm (8 ft 11 in) and depth 170 cm (5 ft 6 in). It was acquired by the museum in 1981 from Mr Ludvík Palach from Moravská Nová Ves. The press was practically complete and had been preserved in very good condition. During restoration work, it was only necessary to replace the pins connecting the two lower logs. The press is made of oak and comprises two strong columns known as stanchions (pillars or props). A single upper log known as a hinge (pin) is inserted into the stanchion and two lower logs known simply as logs (base). The stanchion, hinge and logs make up the frame for the whole press. A threaded hole is hollowed out in the upper log for a hardwood screw (spindle) to pass through. In the lower part of the screw, which makes up the so-called head (mother, pear), two holes have been hollowed out for inserting a bobbin to make the spindle rotate. The press also includes a rectangular bowl (basket) which has a hole on its front side for the outflow of pressed grape juice. This is especially rare for this press, as it is made from just a single piece of wood. Its total height is 100 cm (3 ft 3 in), width 36 cm (1 ft 2 in) and depth 170 cm (5 ft 6 in). If we consider that parts of the press were made from the core, that is, the centre of a tree trunk, the trunk of the oak must have measured at least 140 cm (4 ft 7 in) across. Bowls are usually composed of two or three parts. The press has also preserved the original “goose”, that is a beam transferring the pressure of the spindle onto underlying beams and further across strong boards to the grape pulp. On presses, we can often also observe original decorations in the form of various ornaments, such as hearts, crosses, solar cycles and stars, but also the year and the initials of the owner or the carpenter. Such decorations mostly appeared on the upper log – hinge. On our press, we can notice a decorative carved square containing the inscription LP 1719, indicating the year of manufacture. The square further contains a second, apparently additionally inscribed year, 1766, though it is not known what event this commemorates. Unfortunately, the press is lacking the initials of the owner who ordered it, or the carpenter who made it. Since these mammoth presses were primarily manufactured directly in wine cellars, we can conclude that the customer and the owner of the press was the predecessor of the last owner – Mr Palach.